Prina your savaa ni bhaji is ready! Prina my niece, loves savaa ni bhaji with rotli and so does her dada. 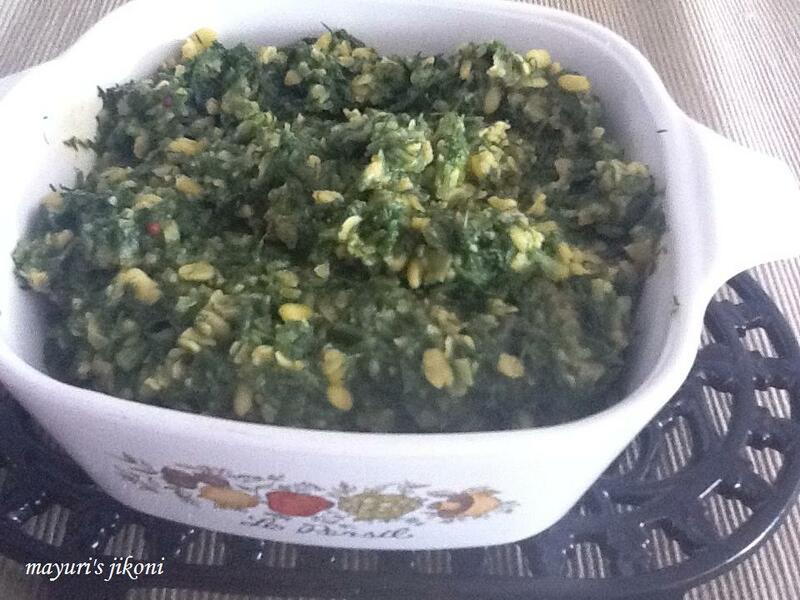 Savaa, suva or dill leaves are prepared as a vegetable in India either with lentils or potatoes. In the western countries these feathery green leaves are used mainly to flavour a stew, salad or soup. It is a herb but grows in abundance in India during the winter season. Big fat bunches sometimes sell for just under 10 rupees. My visit to the Mombasa market this week was a delight as I saw only one seller with a few bunches of the bhaji. I quickly grabbed a few and made the vegetable on the same day. This herb does not stay for too long as the leaves start to turn yellow within a day or two. I love savaa ni bhaji with the lentils but Ajay prefers it with aubergines. Wash and soak the moong dal in the water for 20 to 30 minutes. Remove the root tips and chop the dill finely. Wash it in a sieve thoroughly to remove any mud. When the oil is hot add the mustard and cumin seeds. When they begin to splutter, add the garlic paste and stir fry for a few seconds. Add the chilli and ginger paste. Mix. Add asafoetida and turmeric powder and immediately add the soaked lentils along with the water. Add salt and mix. Lower the heat and cover the pan partially. Let the lentils cook till they are just done. This may take about 5 or 7 minutes. If the water evaporates before the lentils are cooked then just add a ¼ cup more. When the lentils are done add the dill and mix well. Cover the pan and cook over low heat for a further 5 minutes. Be careful it does not burn. If the water evaporates before the dill is done then add a little water. Add coriander cumin powder and mix well. Add one big aubergine finely chopped instead of lentils. Cook the aubergine first and then add the dill. Try and chop the stalks finely so it cooks quickly. I just love this, but prefer dal style, little liquidy.